My "not so" Simple Life: Where's my Home? Terry Treetop is off on another adventure. This time he wonders off chasing a butterfly and becomes lost in the woods. This is another great educational book by Tali Carmi, that is a lot of fun to read and look at the pictures. My son loves these books! 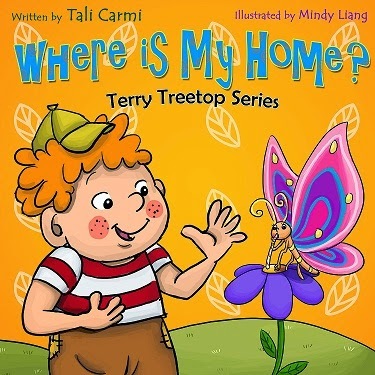 In this adventure, Terry starts off chasing a butterfly, but when he stops to catch his breath and loses site of the butterfly he suddenly realizes he doesn't know where he is or how to get home and it's lunchtime. Then Terry meets a little rabbit who invites Terry to his home for lunch. But when Terry arrives at the rabbits burrow, it is too small for him and clover, the rabbits favorite food, is not very appetizing to Terry.Then the momma rabbit tells Terry the way to go to get home. This interaction is repeated with other inhabitants of the woods and meadow. Then Terry meets a little squirrel who invites him up her tree to share some of her food. We all know how much Terry likes to climb trees! When Terry gets up to her home, the whole is again too small for Terry. So he waits for her on the branch and as he is looking around, he spots his home. He thanks the squirrel and hurries down the tree and to his home. Terry learns to appreciate his home and the food his mom prepares for him. He also learns the importance of having a home that is the rights size for you. This book is a great way to introduce your little ones to various woodland animals. It fosters an interest in the animals and their habitats that you can then expand upon. We loved this book and I would recommend it.